Physical therapists trained in vestibular rehab can provide life-changing benefits to patients who suffer from dizziness and balance disorders. This course will equip you with the tools to evaluate symptoms in patients and determine the cause for dizziness, assessments after functional tests, and the most cutting-edge treatment strategies. You will learn strategies for a thorough, yet efficient evaluation and how to explain the rationale for your evaluation, techniques and subsequent treatments such as canalith repositioning, video goggles, rotary chairs and manual therapy. 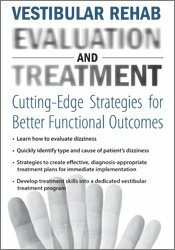 You will never have to tell your patient with dizziness, “I can’t help you.” You will finish this program with a toolbox full of strategies to implement immediately in your clinical practice! Want to learn a quick way to identify the type and cause of your patient’s dizziness? Check out our blog. Multi-disc DVD recording (6 hours, 17 minutes) with electronic manual and instructions. Identify the anatomical structures and neurophysiological systems involved in balance/dizziness disorders. List the symptoms and describe the clinical presentation of a variety of balance and dizziness diagnoses. Perform an efficient and informative vestibular and balance evaluation. Create an effective, diagnosis-appropriate treatment plan you can implement right away. Perform the Epley’s Maneuver and other treatments for BPPV. Collaborate with other healthcare providers to refer the appropriate patients for further work-up. Provide patients with outside resources to help them learn more about their disorders. Develop a “balance-center” approach, tailored to the clinician’s own work setting, identifying key participants.